We were in Laos from the 8th May 2004 until the 6th June. We entered from Mohan (Mengla) in China to Boten in Laos and left from Vientiane across the Friendship Bridge to Nong Khai. Basically we rode south down highway 1 to Pak Mong, and then down highway 13 to Vientiane, with a deviation to Ang Nam Ngum as suggested in the Lonely Planet cycling guide. Laos can be a good country for cycle touring. There is little traffic (only 300,000 cars in the whole country), some main roads are well built, there is cheap accomodation and food is tasty and easy to buy along the way. Many people touring just S.E. Asia make do with a couple of small panniers or just a rucsac strapped to their rear rack. However many roads are in a terrible state of repair so it is well worth researching your planned route before you go, and in more remote parts of the country you will need to carry a tent (or a hammock, tarp and mosquito net) and some food. One serious hazard for the cycle camper is unexploded bombs and mines in the forest, this and the fact that most un-farmed land is densely forested makes camping difficult. Quite seriously, you should avoid hammering tent pegs into the ground anywhere in Laos. We also found ourselves assailed by bees, mosquitos and leeches when we camped. However guesthouses are often a long way apart so you should perhaps be prepared either to camp or to ask for hospitality from local people. The people we met were generally very friendly and other travellers we spoke to had stayed with local people by rigging up their mosquito net on a veranda. The whole country is malarial and there is also a significant risk of dengue fever during the wet season (May - October) so it is important to take precautions against being bitten by mosquitos. Mosquito repellent and mosquito coils are available in towns. You should bring a mosquito net. We obtained our Laos visas from the Lao Consulate in the Cameilia hotel in Kunming, Yunnan, China. For 450Y (about $56) each we got a 30 day "non-immigrant visa" in 24 hours. For three day service you pay 320Y, or for a fifteen day tourist visa 270Y. The visas were valid for entry within two months of issue. At the border the Lao officials gave us fifteen days even though we told them we were staying for thirty days. When we pointed out their mistake they corrected it. Our understanding is that visa extension is only possible in Vientiane, but guesthouses in popular tourist towns all over the country (we saw it in Luang Prabang and Vang Vieng) will extend your visa by sending your passport to a contact in Vientiane, who extends the visa and then sends it back. This takes two working days. The cost is $3-$3.50 per day, usually with a five day minimum extension. Someone told us that the Lao Aviation office in Luang Prabang can extend your visa for $3 per day on the spot. Visa extension in Vientiane is possible for $1 a day. The fine for overstaying your visa is $5 per day if you exit via a land border or $10 per day at Wattay airport in Vientiane. Although there were signs forbidding cyclists, no one objected to us pedalling across the Friendship Bridge. Cyclists we met who had come from Thailand said they were told to take a bus, but the bus driver refused them so they were allowed to cycle. On a Sunday afternoon there was almost no traffic. There was a 5000 kip (50c) exit tax at the bridge. After China it was a pleasant change to see a few English signs (like "guesthouse" and "noodle shop") and meet more locals who spoke English. A little Lao goes a long way and many of the people you will meet between the tourist centres speak no English. Lonely Planet do a good phrasebook, I thought the language was easier than Chinese, but that isn't saying much! Fortunately there is little need to learn to read as most signs are also in either English or French. Lao is quite simiar to Thai and Cambodian so if you are touring these countries the effort of learning some language is even more worthwhile. The Lonely Planet Road Atlas of Thailand, Vietnam, Laos and Cambodia is probably the best map available for Laos. Disappointingly there is no local script, place names do not always match the road signs and the distances marked between junctions and towns are always an underestimate (in hilly areas by as much as 40%). The mapping of minor roads is also often badly inacurate. Maps are available in Vientienne of the whole country at a rather small scale, these are probably just as good as the LP Atlas. If you are sticking to the major roads, the maps in the LP guide would be adequate. We did see some beautiful 1:200,000 scale maps with contours in a tour office, but I don't know where you could buy them. We were in Laos for 30 days and spent $400. We spent only kip. Guesthouses typically cost $2-3, in Luang Prabang (out of season) $4 bought an en-suite room. I believe there is now an ATM in Vientiane but dollars remain the easist way to bring money into the country. We brought all our money into Laos as Chinese Yuan. Kip cannot be exchanged outside the country. The weather in May and early June varied from sweltering sunny days of over 35°C, to rain all day. We actually came to prefer the rain, it made it much cooler and pleasanter for cycling. It is so warm that it is not such a problem if you get wet (a cape is good to keep the top half dry while allowing cool air to the legs). It might not be a good time for off road cycling but on the tarmac it was not a bad season for cycling. We tended to start very early and try to finish around lunchtime, but other cyclists we met didn't seem to mind the heat so much and just rode a normal day. 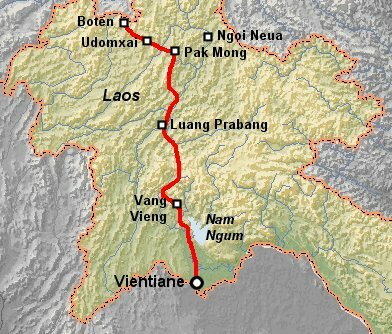 Boten is currently the only legal entry point for foreigners from China to Laos. It is a large village with a bank, shops, restaurants and at least a couple of guesthouses. The bank changes dollars, yuan and Thai baht to Lao kip. I'm not sure if it changes money the other way. If the bank is shut, hang around and someone may open it for you. Heading south on highway 1 there is a large village with shops, restuarants and probably accomodation at the junction with highway 3 to Luang Nam Tha. The next accomodation is at Na Maw (no sign reading Na Maw appears on the road, but it is the obvious big village 50km from the border) which has about four guesthouses, shops, restaurants and a small market. Fifty kilometers further and over a 400m pass is Udomxai, a pleasant town with a market, banks, internet ($4/hour), guesthouses and shops (even a few bike spares in the market). From Udomxai the road to Pak Mong goes over a couple of 400-500m passes. It is reasonably well surfaced and traffic is very light. It is 83km sweaty kilometers to Pak Mong and there are no guesthouses but there is a large village with shops after about 53km. Pak Mong has several guesthouses, restaurants and basic shops. We also noticed that the road south from Udomxai to Muang Beng and Pakbeng was recently surfaced. The road east from Pak Mong to Nong Khiaw is surfaced abeit bumpy and there are guesthouses in Nam Bak and Nong Khiaw. From Pak Mong we headed south down highway 13 to Luang Prabang. We stopped at the "Vico Holiday Resort" 81km from Pak Mong (32km from Luang Prabang) in the village of Somsanuk (immediately after crossing the Nam Ou river), where the only accomodation was slightly tatty but spacious chalets for $4 or even bigger ones for $7. The road was well surfaced all the way, largely flatish and there were villages with small shops and snack stalls at least every 10km. Apart from the "Holiday Resort" we didn't see any accomodation. From Somsanuk we made a 10km each way side trip to Ban Pak Ou from where we got a ferry (50c each) to see the Pak Ou caves. Ban Pak Ou had a couple of restaurants but nowhere to stay, although you could probably rig up your mosquito net in a restaurant or stay with a villager if you asked. The road was a good dirt road with some short but steep climbs, it continued along the Mekong to rejoin the highway at 91km from Pak Mong (22km from Luang Prabang). The rest of the way to Luang Prabang was flatish and very pleasant. Luang Prabang is a lovely place to spend a few days, beautiful temples everywhere, lots of good food (cheap in the market) and good places to stay from $3 a room. Leaving Luang Prabang (400m altitude) we headed south on highway 13. We passed the "Khanty Guesthouse" after 25km (km 361). Then the road climbed and descended a 600m hill. Halfway down, 50km from Luang Prabang (km 336), we stopped in a roadside bamboo shelter by a stream for the night (mosquito net essential!). The road then climbed 1000m, at the top in the village of Kiou Ka Cham there are two guesthouses, restaurants and basic shops. From Kiou Ka Cham the road undulates to Muang Phu Khun where there is one guesthouse. Then it is largely downhill to Kasi which has two guesthouses, then flatish to Vang Vieng. Good road and very scenic from Kiou Ka Cham onwards. From Vang Vieng (km 155) we headed south on highway 13 to Phon Hong. We passed guesthouses at km 144, km 132 and km 93. The road undulated a little and became a little more busy but was still pretty quiet. At Phon Hong we left the highway and followed the route given in the Lonely Planet cycling guide. This took us about 25km eastwards to the Nam Ngum reservoir where we stayed in the village of Na Nam near the dam. On the way we saw guesthouses near Phon Hong, about halfway between Phon Hong and Thalat, and in Thalat. From Na Nam south to Vientiane the road is good and only busy for the last 20km. We saw guesthouses 31km, 49km and 75km from Na Nam, which is 64km, 46km and 20km from Vientiane. Although there were signs forbidding cyclists, no one objected to us pedalling across the Friendship Bridge to Thailand. Cyclists we met who had come from Thailand said they were told to take a bus, but the bus driver refused them so they were allowed to cycle. On a Sunday afternoon there was almost no traffic. There was a 5000 kip (50c) exit tax at the bridge. km 70 Phon Hong. Didn't actually see a guesthouse but it is a fair sized town. There is a guesthouse 3km north and 1km east of the town. The town has restaurants and a range of shops. From Phon Hong we lef the highway and went via the Ang Nam Ngum reservoir. There were guesthouses in Thalat and one in Na Nam on the reservoir (beautiful location). From Na Nam to Vientiane we saw guesthouses 31km, 49km and 75km from Na Nam, which is 64km, 46km and 20km from Vientiane.